Malawi’s Ministry of Natural Resources, Energy and Mining through the Department of National Parks and Wildlife, supported by South African-based NGO, Peace Parks Foundation, translocated 34 elephants from Liwonde National Park to the plateau of Nyika National Park. As the last elephants disappeared into the thick bush of their new home to reunite with the rest of their family unit, game capture and veterinarian teams exchange glances of relief – grateful that their skills and dedication had been able to keep these African giants safe during the 700km journey from Liwonde to Nyika. It is never a conservationist’s first choice to put even one elephant through such a potentially arduous experience, let alone 34. In Liwonde, though, the carrying capacity for elephant had been far exceeded. Nyika, on the other hand, still offers ample space and will benefit from the addition of new elephant groups to improve viability of the herd and fast-track recovery of critical numbers. A mere three decades ago, more than 300 elephants graced the steep foothills of the Nyika Plateau spanning the international boundary between Malawi and Zambia. Tragically, extreme poaching pressure resulted in an estimated 67% decline in this population since 1992. 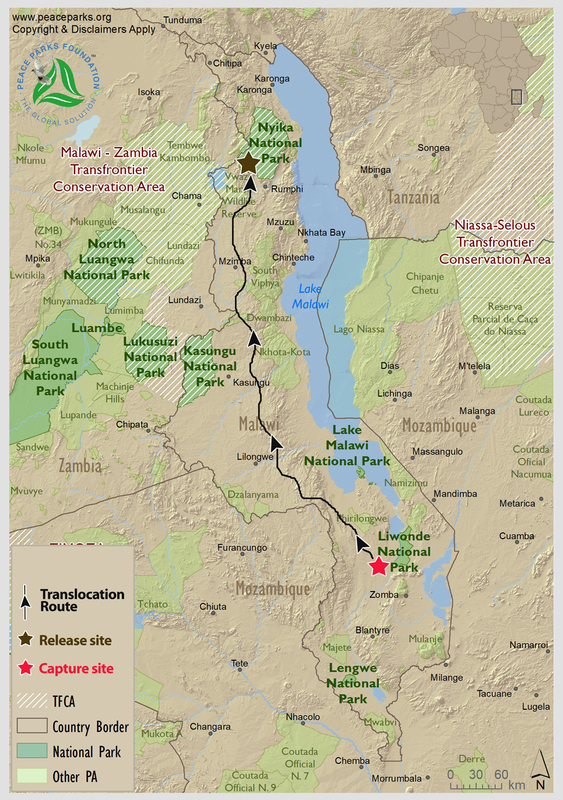 Now, only approximately 100 elephants can still be found roaming the 3 200 square kilometres of Nyika National Parks (the two parks with the same name straddle the international border between Malawi and Zambia), a core component of the Malawi Zambia Transfrontier Conservation Area (TFCA). With the signing of the Treaty by the Heads of State of Malawi and Zambia to formally establish the TFCA in 2015, the German Government through KfW and Peace Parks Foundation as implementing partners, is making a grant of €18m available to develop the TFCA over five years. Thanks to increased anti-poaching efforts made possible through the TFCA establishment process, the Nyika National Park has seen a steady increase of wildlife over the years. This trend is also evident in the growth of the elephant population that has multiplied considerably from the mere 32 elephants counted in 2004. The additional 34 elephant will see new genes introduced to bolster the population health of the resident population. The translocation was initiated by the Government of Malawi, and funded by Peace Parks Foundation through a substantial investment received from Stichting Dioraphte. Much of the funding is being used to ensure the seamless and safe acclimatisation of the elephants to their new environment. For the next 12 months, the elephants will remain in a newly constructed sanctuary of 7 000ha that is big enough for them to feed naturally from the vegetation. They will be monitored closely on a daily basis and only once the newly introduced herd is established, will they be released into the larger park. A light aircraft has also been purchased and two staff members of the country’s Department of National Parks and Wildlife will be trained as pilots. The aerial support will aid in monitoring the translocated elephants once released from the sanctuary, as well as with day-to-day conservation management within Nyika National Parks and Vwaza Marsh Wildlife Reserve. In addition, the matriarch elephants have been fitted with VHF and satellite collars, to enable tracking of their movements.